Democrats destroyed the Republicans on the budget deal: The Murray-Ryan plan is a big win for President Obama and his party. How the Democrats routed the GOP on spending and stopped the raid on entitlements. 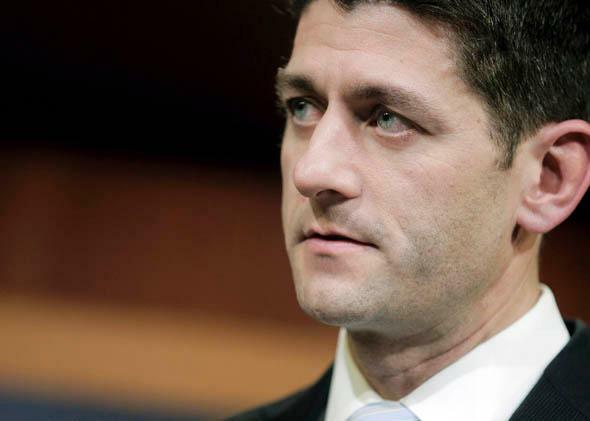 House Budget Committee Chairman Paul Ryan (R-Wisc.) announcing the bipartisan budget deal on Tuesday. Five years ago, when Sen. Barack Obama was running for president, he’d occasionally be confronted with the media’s all-purpose stumper for liberals. What, a host or moderator would ask, would you do to tackle entitlements? Obama would say whatever he needed to say. But now, look at the Budget Conference Committee’s two-year plan—or “the Murray–Ryan plan,” as the gods of brief headlines have dubbed it. It restores some of the money cut by sequestration, and it makes federal employees put up more of their own money for their pensions. It doesn’t even scratch entitlements. Wisconsin Rep. Paul Ryan has made a chipper (and seemingly successful) pitch to conservatives about how the deal tackles “automatic spending,” but that’s rhetorical taekwondo, an attempt to put $12 billion of pension savings on the level of trillion-dollar entitlements. On Wednesday, as Ryan sold the plan to Republicans, the old “debt crisis” rhetoric that defined 2011 and 2012 had vanished completely. Republicans had spent most of 2013 calling sequestration a win for the party, something that cut the deficit and gave them “leverage” for the next rounds of talks. That was the point of sequestration, that its general offensiveness would force both parties back to long-term spending negotiations, and that the entitlement state would take a hit. And then the budget negotiated by Ryan actually blew through the $967 billion sequestration spending cap for the next fiscal year. Oh, well. If, then, maybe later—but didn’t Republicans get a chance at actual entitlement cuts, then blow it? Back in 2011, when they had Obama on the ropes, couldn’t they have gotten a Democratic president to swing the ax at Social Security? Remember how S&P downgraded America’s credit rating because “the fiscal consolidation plan that Congress and the Administration recently agreed to falls short of what, in our view, would be necessary to stabilize the government’s medium-term debt dynamics”? Couldn’t they have gotten more than that? Tennessee Rep. Diane Black, another class of 2010 member, was one of the more conservative Republicans in the Ryan–Murray budget conference. Social Security cuts, she said, were indeed, sort of, “on the table” before the talks started. Black wasn’t saying it explicitly, but in this version of the story the parties had reversed their roles in the “narrative.” The Republicans—Paul Ryan especially—were bravely compromising to keep the government running and end the era of Dec. 31 kludge-o-matic deals. The Democrats, they were the intransigent ones, the short-sighted deal-killers. The Democrats will proudly wear that label, at least when it comes to Social Security. Yes, the most progressive members of the party had sworn not to support a “grand bargain” or sequestration fix that cut Social Security. They’ll tell you they were proven right. Now that they’ve lost, what’s the future of that entitlement reform President Obama keeps saying he’s ready for? How will Republicans force him to the proverbial table where all Washington deals are birthed? They don’t know. A slowly growing economy, higher taxes, and trimmed spending has cut the deficit down to half of its recession high. Fix the Debt, the $43 million advocacy group that staged press conference after stunt after press conference to “seize the moment” on entitlement reform, is winding down and shedding staff. The 2013 budget agreement pays for a smaller government than Democrats would have liked. It also concludes the short era of Grand Bargaining. They’ll take that deal.